Adventures in colors-that-photograph-weird-but-still-pretty continue with Show Steel-er from Sally Hansen! This was an impulse buy at probably Target, so I am not sure when it was released or which collection it is from...but it is new to me! Recently, I have been obsessed with shades like this. All these grayed-out purples and blues and blush tones. They are really speaking to me, especially for the spring and summer. I am not sure why, but maybe it is because I live at the coast and these are the colors I see this time of year? Reading reviews of this color, after I bought it of course because that is how I roll, it seems like a lot of people had trouble with the formula. I did not experience any of those problems. It applied smooth and easy in two thin coats. If I had shorter nails and wasn't going to taking pictures, I could definitely get away with one medium coat. So what is the verdict? 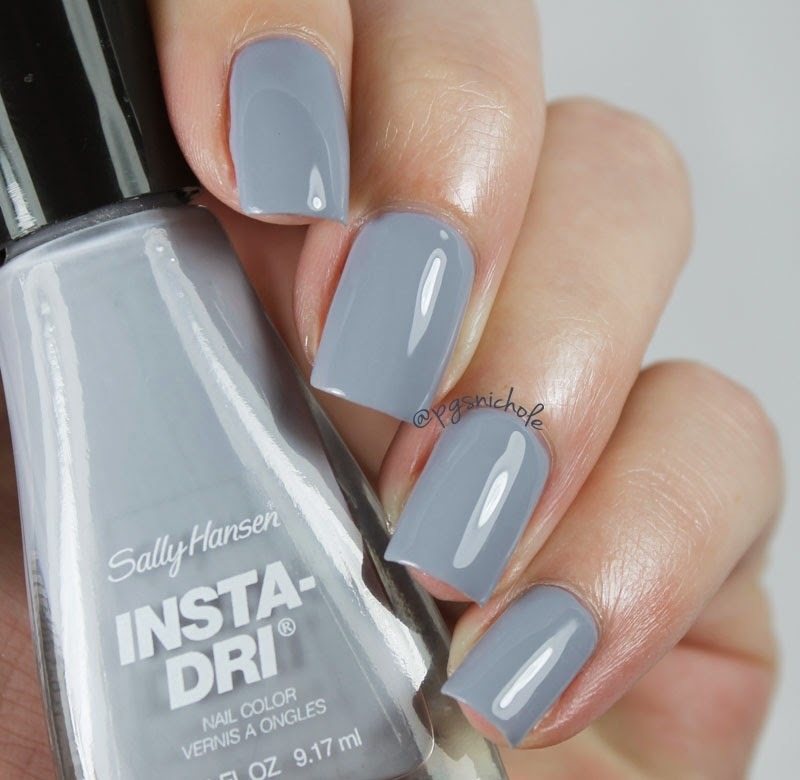 Are you in love with these pale shades as much as I am? I've got tons more in the pipeline still...so I hope they don't make you gag or cry or both. Beautiful sleek soft shade on you. Looks more grey in your photos with the bottle and more purple in the shot without, the appearance must draw influence from its surroundings. I love colors like this! it is very changeable! I was kinda bummed by the pics initially because it didn't quite look right...but they are close. LOVE! Oy vey, these posts are not good for me... Must collect all the neutrals! Insta Dri polishes are quality, yo. Have you tried High Speed yet? Oh and also, you know what this reminds me a little of? Your franken, Asilomar, but with no purple or shimmer. I enjoy these so much. I have not! But its on my shopping list. You know me and neutrals...And I think Asilomar is what sparked this love of pale gray-purples.